Summary:Natalie, a seventeen-year-old former drama club member who now writes a relationship column for her school newspaper, decides to go undercover as a student at an all-boys boarding school so that she can figure out what guys are really like. This sounds sooo cool! I think I'm really going to like this! And an all boys boarding school, awesome!!! I want to read this one SO BADLY! :) And the cover is adorable! This one does look like a lot of fun - I will have to check it out when it's released. This sounds amazing! Thanks for a great WOW: I'm going to go check it out. This looks like it would be a riot! Can I just say the cover of this book made me LOL in a huge way! I think I may have to steal that one for photog-sessions for playing around. Excellent pick this week. 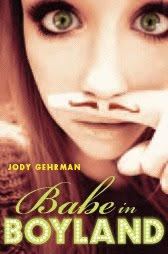 I love that cover and I love Jody Gehrman so this should be great! This one sounds awesome! I'm adding it to my TBR list! I love the cover as well! Cute cover, it made me smile. I hope you get your book and that you enjoy it. Check out what I am Waiting on Wednesday for. Very Shakespearian, and to be truthful a gril pretending to be a guy is always my favorite type of manga (like Hana Kimi) That alone makes me think I might like this story. what I'm waiting for can be found here.